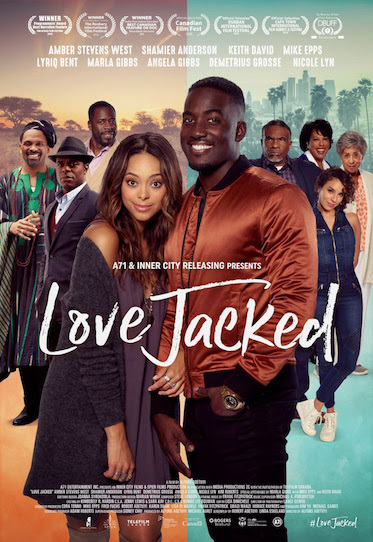 Love is not easy, life is not easy, and lying is not easy, and all of those are quite apparent in Love Jacked, your usual film taking place in a fictional small town where people’s paths cross like crazy. Maya Johnson (Amber Stevens West) is a woman trying to deal with a lot of issues. Anyways, she meets another person named Malcolm (Shamier Anderson) at a cafe and tells her story about the struggles she has with her controlling father (Keith David) and an incredible trip to Africa where she experiences a romantic pitfall with African millionaire resident Mtumbe (Demetrius Grosse). However, thanks to her cowardly nature, she has lied and her family believes Mr. Filthy Rich is coming for an instant marriage (she never mentioned him cheating on her). But Malcolm has his own issues when his associate Tyrell (Lyriq Bent) finds out that Malcolm stole his secret stash of money. Malcolm escapes with his life and finds solace in Maya’s truck. But now there’s only one way they can both solve the dilemmas they have: Malcolm has to lay low in disguise and Maya has to pretend her so-called fiance is coming home to marry her. Hilarity can only ensue from there as Malcolm continues the phony charade in a costume, and Maya’s wedding is coming faster than ever. So naturally, the two unnaturally connected lovers have to find a way out of it in the most silly but legit sounding excuse possible. But it won’t be long before things are about to get out of hand for poor Malcolm. Either the family figures out he’s a fraud or Tyrell will finally have him hunted down. Or something even weirder. Maya’s unexpected feelings for Malcolm only make it more difficult. The film plays out as one of the most silliest things I’ve ever seen. The characters are laughably entertaining, displaying a wide range of one-types, with our protagonists being rather rounded. The concept only gets more and more ridiculous, and sometimes even pointless. Thanks to the writing, the movie does have its moments but also provides with some rather awkward throwaway jokes and all around confusion, even at the beginning which I was unsure of myself. But for what the movie is worth, it still does pretty well. Despite the oddities, thinks not just work out for everyone in the movie, but the plot plays out in a style that comes out weird and slowly makes more sense near the end. I don’t know, it’s a good laugh if you’re into silly incidents. And romantic comedies. I enjoy my fair share of romantic comedies. Probably because they’re better than real-life scenarios. It’s a good film and it’s worth checking out. Love Jacked will be showing in Cineplex and Landmark theatres all throughout Canadian cities including Montreal, Toronto, Windsor, Kelowna, Ottawa, Winnipeg, Kitchener and of course, Vancouver.